We bought this fixture for our guest powder room. Looks lovely. I feel that it adds a bit of class to the room. I would recommend this fixture. Add some much-needed light to your home with this flush mount chandelier. This chandelier provides a modern look and is made with glass and iron. Perfect to hang in your entryway or foyer, this chandelier is dimmable and perfect for areas with low ceilings. We hung this light in our newly renovated kitchen, over the sink. All I can say is, Wow! The light looks about 4x the price that it really is. It was easy to assemble and install, and is flawless. It is a bit more copper-looking in person than in the photos (photos appear more on the black side) but we love it just as it. For a nice touch, we also added the Edison style, "old school" looking fillament bulbs. It looks incredible. Perfect size for my entryway. It updated the space beautifully. I love that I can remove the glass for cleaning easily. It took a while to find, but it was worth the search. Our foyer is 11' x 5' with 9' ceiling height and the flush mount of this chandelier is perfect. We were concerned it might hang down too low, but it definitely does not. The packaging was impressive and it arrived very quickly. It really adds just the right look to our foyer. I bought this fixture for my entryway. 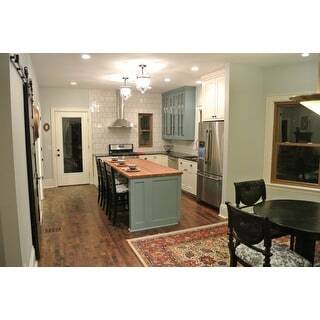 It is the perfect size for 9 foot ceilings; not too short, not too long. The quality seems good, and the appearance is beautiful. The description might be a bit misleading in that the finish is primarily a dark oil-rubbed bronze (as shown in the photo) with copper highlights that are hardly noticeable from a distance. It arrived on time in good condition, and the price was very reasonable. My husband had no trouble installing it. I'm very happy with it and have received compliments! We bought 2 of these for our foyer and it looks really great. 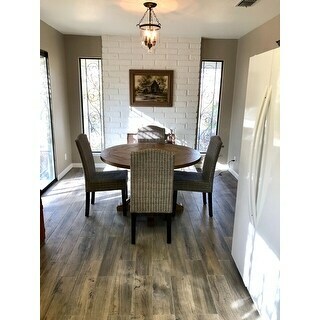 I saw something similar on Houzz and was able to recreate the look at a very good price. Looks exactly like the picture. The metal is a little distressed, as described, and from a distance looks black. Received this chandelier in record time, and installed it in record time! The fixture looks like I paid more for it than I actually did, it arrived perfectly packaged with no damages. The glass lantern has is heavy weight of glass so I was worried whether the weight would be carried by the mounting, but so far no problems! I would highly recommend this fixture. 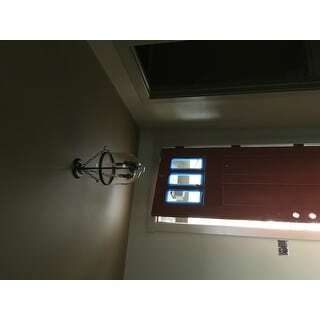 This is the perfect light for our entryway - it has a very high-end look for a fraction of the price. We highly recommend this item!! We bought two of these chandeliers to go in a bathroom suite. The light fixtures are stunning. We are well pleased with the quality of this product. Easy to install. Excellent packaging. My daughter, who is an expert in interior design, was surprised that I could choose such an elegant, fashionable light fixture without her help! The light is equivalent to other high end fixtures yet at a lower price! It lights the room beautifully and I have already received several compliments! Beautiful and classy! Great quality for the price! I loved this light, but ultimately it was a bit too low for an 8 ft. ceiling entryway so I sent it back. Nothing to do with product except I have a tall family. It really looks great and very inexpensive for the quality. I've had this installed for a couple of years now. It's beautiful and I get lots of compliments. It's smaller than I anticipated but looks fine in my entry way. If I had to do again I would buy one a little bigger- so just watch your sizing preference. Also, glass gets cloudy with humidity in Texas and it's not the easiest to clean, but I use windshield cleaner which keeps it cleaner longer. We purchased 2 of these for over an island of a house I flipped. The quality was great for the price. The glass shades were particularly of nice quality. Wonderful! I put it in my foyer. This light does not look cheap at all. Very well made too. this light is amazing , it’s absolutley beautiful in person ! I hung this in my 1/2 bath and I love it. Very nice for the price. Beautiful! Look like it’s from Pottery Barn with a cheaper price tag. Excellent purchase, as a designer I’m super pleased with the quality, ease of install and look. Love this! 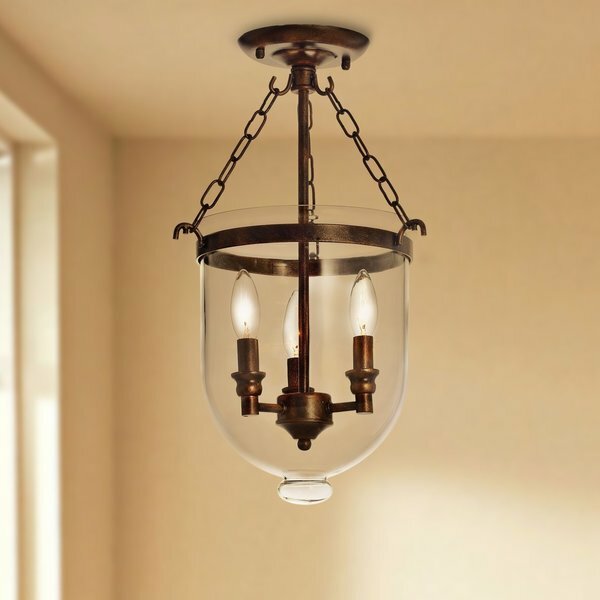 We used this light fixture in a mudroom/guest bathroom/entryway. It is perfect for where it is placed and it looks elegant and rustic. These lights look great in our upstairs hallway. I bought three of them and they look great together. The only complaint is that they collect a lot of dust, and have to be cleaned fairly often but otherwise great! "is There a way to get a replacement for the glass.?" "what is the total possible wattage of this fixture- is it 60 watt total or is it 60 watts per bulb, totaling 180 watts?" The total possible wattage of this fixture is 180 watts - it is 60 watts per bulb, totaling 180 watts. I bought this as a gift for my family. My husband installed the light and he said he believes it is 60 Watts per bulb. Hope this helps. "could this hang straight installed on a sloped ceiling?" No, this could not hang straight installed on a sloped ceiling. No, I purchased this and that center rod is stiff so it would hold your lights sideways. We have this light and the pole is hard-mounted onto the ceiling cap, so no- it would not hang straight. When I was shopping for mine, however, I did find 2 almost identical ones that hung from a chain in the center. That style would work! I think they were both in Overstock. Pull up this one and see "suggestions" of similar items that they throw in after the description... or to the right of it! "What is the weight of the chandelier?" Three pounds, maybe. It's not very heavy, I replaced a heavy brass chandelier with it. It lights closer to the ceiling, though, so be prepared for less light in the room. "I want to replace a 6-light chandelier wth this. Would this give off enough light?" This would give off enough light if you use higher wattage bulbs (60-watt) or LED bulbs. "Before I purchase, can you tell me if this can be used with a dimmer? Thanks!" Yes, this can be set up with a dimmer switch. "I have 10ft ceilings, will this work for them or be up too high." i think it'll be too high. there are other options i believe from OS that are flush mount though.